Change the flavor by adding chili powder, chopped cilantro or parsley, or hot sauce. Blend to desired consistency (more time for smooth dip, less for a chunky dip). If hummus seems too thick, add 2 teaspoons of water. Spread garbanzo beans on a large plate. Mash well with a fork until they are as smooth as you like. Mix with other ingredients in a small bowl. 1 Comments for "Hummus (no tahini)"
I have made this recipe many times. Both with real garlic and powdered garlic. One time I had a really large garlic clove and it was a tad too 'garlicy' so I now make sure to pick a small/regular size clove. 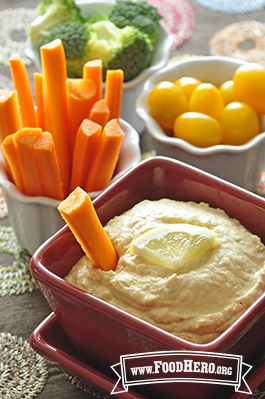 Kids love to dip with carrots or whole-grain crackers!